Kimberly Willoughby never felt good enough. Too short. Too overweight. She believed that everyone else deserved a good life, but not her. It’s taken her many years and countless tears, but today, at age 48, she’s living the life she’s always dreamed about. But first, she traveled a road filled with hardship, addiction and, at last, recovery. Growing up in Mount Sterling, Kentucky, Kimberly graduated from college, became a nurse, married and had two children. But throughout much of her life, Kimberly struggled with her first addiction: food. At 300 pounds, Kimberly underwent gastric bypass surgery in 2004. Adapting to a new lifestyle, she was optimistic that her old habits would disappear. But in 2007, her marriage began to suffer. Kimberly filed for divorce and moved out. For six months, she experienced insomnia and drank every night. Kimberly and her husband reunited in 2008, but their issues were not resolved. 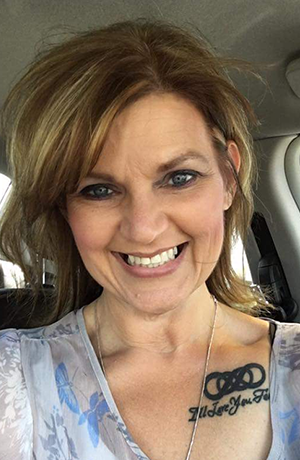 One day, Kimberly learned she would be a grandmother, but the good news came with a condition from her daughter: Kimberly would not be allowed to see her grandchild if she continued to drink. She started sneaking her drinking, hoping her daughter and husband wouldn’t find out. In 2014, Kimberly and her daughter tossed around the idea of moving to Florida, but those plans changed when her daughter married a man in the military and they moved to a military base in Germany. Kimberly — along with her husband, mother and stepfather — proceeded with the move from Kentucky to Inverness, Florida. She hoped that a change of scenery would mend her marriage and her outlook on life. For a few months, it worked. Kimberly did not touch a drink. But soon, she her marriage started to unravel again. By 2016, Kimberly was drinking all day, every day. Kimberly found ways to drink as much and as often as she could. Before work. At work. In a closet. In her water bottle. Things went from bad to worse when she started abusing prescription medications. Kimberly had chronic back pain from a work-related injury she suffered at age 19, and a doctor prescribed her Tramadol, a pain reliever. Around the same time, she had a surgery and was prescribed Percocet, another pain medicine. From then on, Kimberly took any prescription she could get her hands on. Kimberly decided to quit her job as a nurse at a local hospital, but on her last day, she was caught drinking and had to complete a urine screening. She was reported to the Florida Department of Health and was referred to Scott Teitelbaum, M.D., F.A.S.M., the medical director of the UF Health Florida Recovery Center, or FRC, for an evaluation. In July, she grudgingly met with Teitelbaum, who recommended a treatment plan and explained that she had seven days to choose a facility for care. Upset and angry, Kimberly decided instead enrolled in a six-week treatment program in Georgia. There, she stopped drinking but lied her way through therapy. She didn’t fool anyone. “They said, ‘If you’re not going to talk to us, then there’s nothing to work on,’ ” she said. Kimberly attended Alcoholics Anonymous, but she didn’t embrace AA’s mission. After months of not drinking, Kimberly started relying on over-the-counter diet pills. Instead of the suggested daily intake of two pills, Kimberly was taking up to 12. Meanwhile, a storm continued to brew at home. “My husband didn’t believe I was going to AA,” she said. For a while, her husband would go with her to AA, watching her every move but not participating. Kimberly started using Tramadol again. When she ran out, she started taking her dog’s medications. She had to take a random urine drug screening on a Monday, but this time, she took a handful of pills the weekend prior, hoping to get caught. Kimberly reported for another evaluation with Teitelbaum at the end of July of 2017. She brought letters of recommendation from participants at AA, her manager, co-workers and her church to show how well she had been doing. Teitelbaum called her personally to tell her that her levels were too high to have only taken a handful of pills over the weekend. Now was the time to come clean. Teitelbaum recommended inpatient treatment to the board of nursing where they contacted her with a list of three to four facilities to attend. This time, Kimberly was ready to participate in treatment. On Aug. 21, 2017, she was admitted to the UF Health Shands Psychiatric Hospital and checked into the FRC the next day. Kimberly enrolled in the partial hospitalization program where she lived at the addiction treatment facility and was treated by Jamie Smolen, M.D., a UF Health psychiatrist, and Jorelle Degen, L.M.H.C., a UF Health substance abuse therapist. Kimberly said the turning point came when her husband attended a therapy session. Her husband left that day — for good. Kimberly connected with a women’s advocacy group, and continued to work on her addiction and self-care. On Oct. 3, 2017, Kimberly completed the recovery program and moved into a sober house. She continued to practice all of the recovery steps. In January, 2018, Kimberly returned to work as a nurse. She continues to remain very active at the FRC and goes back one to two times a week to meet for after care. She’s also involved in an FRC reunion event and still sees Smolen. Kimberly stayed in Gainesville when the rest of her family moved back to Kentucky. Her divorce was finalized in February. Today, Kimberly is employed, spends time with her Dalmatian “Katie,” continues therapy, maintains healthy relationships, practices yoga, sponsors other recovering addicts and teaches a nursery class at her church on Sundays. Scott A Teitelbaum, M.D., F.A.S.M.